iPhone 3Gs: Why would anyone buy it? The new iPhone 3G S is offered in the same 16GB version, but it is also offered in a new 32GB version. So if you found yourself unable to hold all of your music, photos, videos, and applications, this is definitely a plus! The 3G iPhone has a 2 megapixel camera, which can not Autofocus or record video. The new 3G S has been upgraded with a 3 megapixel camera, with video recording capabilities and Autofocus. This is also a useful upgrade. The only other things the new 3G S is offering is a compass, “better” battery life, improved performance, and voice control. Every other new feature, such as Copy & Paste, Search, Voice Memos, Landscape Keyboard, and MMS are also available on the iPhone 3G with the 3.0 software (although, it can’t send video like the 3G S). Apple is releasing a load of new API’s that will allow developers to add many new features to applications. Some of these are Peer-to-Peer gaming, Tom-Tom Navigation, and peripherals. Apple has added the ability to send MMS and tethering, but AT&T has said that they are afraid their network will not be able to support these features until “late Summer”. If you currently own the iPhone, I would recommend you upgrade to the 3G S if you liked your iPhone even a little. The new features are definitely a huge improvement! Although, if you don’t want to spend the $199/$299 price for the few newer features, it would still be smart to buy the iPhone 3G at the new $99 price. But if you currently own the 3G, I don’t think you should hop on to the new Apple product bandwagon quite yet. A lot of the new features are coming to the 3G in the 3.0 software update, and some of those features won’t work until late Summer, when AT&T have said that they will allow tethering and MMS. Also, the few new features that are offered with the 3G S might not be worth $199/$299. You might be better off keeping your current plan, if you don’t have the upgrade necessary to get the “cheaper” price. I would like to say up front that I am currently an AT&T Customer. I do not own an iPhone, but I do own an iPod Touch, and an LG Vu. So switching to sprint and buying a Palm Pre is currently not something I can do easily. I was able to get my hands on a demo Palm Pre today and got to play around with it. It has a nice bulk to it, and is smaller than the iPhone 3G, but it is a bit thicker to house the sliding keyboard. The weight of it wasn’t really bad, and I could see using it for long periods of time. The touch screen worked well, and the OS was very sleek and intuitive. Multiple applications worked amazingly, and I noticed very little slow down with about 5-6 apps running. The app store is pretty bare right now, but does have a good selection of fun and useful apps. The keyboard was also really good quality, much better than on the G1. The keys are small, but seem to be usable for simple text entry. The sliding seemed awkward at first, but I’m sure it would be easy to get used to. I did not have to time to look into any customization or settings, so I don’t know what can be changed about the touch screen, keyboard, or the OS itself. I would have to guess the ability to change brightness. Overall, I think the Palm Pre will definitely help Palm to stay afloat in the post-iPhone market, or at least the phone OS development market. If you are currently on Sprint and really want an iPhone like (or better?) 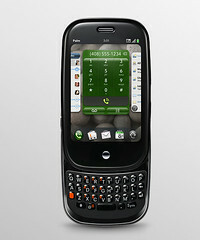 experience, then the Palm Pre is definitely the phone to get! In case you didn’t know Apple Inc. cut the price of the iPhone and dropped some laptops by $300. Those of you that don’t have an iPhone may think that now is the time to get one. But just as you should expect from Apple, they unveiled a new model called the 3G S. It will include a faster processor, and internal compass, improved photo camera, and best of all a video camera. A 16-gigabyte version of the 3G S will cost $199 and a 32-gigabyte model will be $299. The new versions will be released on June 19 just as the 2-year contracts for the original buyers will expire. Apple is hoping that the new more expensive versions will draw you in with their new features instead of the older 3G models which are cheaper. So if you don’t really care to have all of the new features then your best bet would be to go for the older 3G model and save $100. This year at E3, the Big Three all announced some form of motion control in the near future. I think they all have their pros and cons. Project Natal looked very nice at E3, but it did appear to have it’s problems. The facial recognition seemed to work well, and the breakout type game did too. But the avatar movement seemed like it broke at times. Nintendo has talked about the Wii Motion Plus for awhile now, and it does seem like it may be worth it, especially if they package it with a good game like Wii Play. The fact that it’s not backwards compatible is a bit stupid, but it is about time they improved the control. I loved the original Eye Toy, and this seems just as amazing. The 1:1 movement worked well, and the many demonstrations of it all looked great! There weren’t many things that seemed broken with it, but they could go the wrong way. Every company seems to be bringing their all with this technology, so it will be very interesting to see which succeeds and which doesn’t do as well. Seeing as I have already invested in the Wii, I think the Motion Plus will add a lot to the immersion of the game. However, I like where Microsoft is heading, and a lot of my friends have 360’s, and I wouldn’t mind whooping them at a game of breakout! Which company do you think is bringing the best motion control technology to the gamers? Leave a comment below with you thoughts! Microsoft has made two videos with their envisions of the future. The first video shows a boutique and showcases pictures, contacts, and graphical works. The second video shows the design process of a room. What do you think of Microsoft’s Envisions for the Future? Leave a comment! See all the problems I have. Digital TV Transition moving to June 12? On Monday, the Senate approved a new date for the transition to digital television – June 12. Congress will soon follow suit. Is it really necessary to delay this anymore? PSA have been floating around for a while now, and people have had plenty of time to pick up a converter box. Will this change of date confuse the people who have bought new HD TV’s and other new electronics for the transition? Are there not enough converter boxes to go around? I think there should be a test transition, if possible, before the actual change. If people are unable to get channels, they can call their local TV company for instructions. The malicious program – also known as Downadup or Kido – was first discovered in October 2008. Speaking to the BBC, F-Secure’s chief research officer, Mikko Hypponen, said there was still a real risk to users. “Total infections appear to be peaking. That said, a full count is hard, because we also don’t know how many machines are being cleaned. But we estimate there are still more than 9m infected PCs world wide. “It is scary thinking about how much control they [a hacker] could have over all these computers. They would have access to millions of machines with full administrator rights. Experts say users should have up-to-date anti-virus software and install Microsoft‘s MS08-067 patch. The patch is known as KB958644. “Microsoft did a good job of updating people’s home computers, but the virus continues to infect business who have ignored the patch update. “A shortage of IT staff during the holiday break didn’t help and rolling out a patch over a large number of computers isn’t easy. “What’s more, if your users are using weak passwords – 12345, QWERTY, etc – then the virus can crack them in short order,” he added. Anti-virus firm F-Secure says that the worm uses a complicated algorithm to generate hundreds of different domain names every day, such as mphtfrxs.net, imctaef.cc, and hcweu.org. Only one of these will actually be the site used to download the hackers’ files. On the face of it, tracing this one site is almost impossible. Speaking to the BBC, Kaspersky Lab’s security analyst Eddy Willems said that a new strain of the worm was complicating matters. “The replication methods are quite good. It’s using multiple mechanisms, including USB sticks, so if someone got an infection from one company and then takes his USB stick to another firm, it could infect that network too. It also downloads lots of content and creating new variants though this mechanism. “Of course, the real problem is that people haven’t patched their software,” he added. I just got my iPod Touch for Christmas but I fell in love with it instantly. I had apps on it within the hour. So I’m gonna rundown my favorite apps of 2008. 5. Flashlight- I don’t use it that often but when I do it is very useful. It has to be a standard to anyone who ever needs a light in a dark situation. 4. Audi A4– It was a free game where you dive around a test driving course from overhead view. It’s quite fun once you learn not to run into the cones. 3. Sol Free- It throws a different spin on the original Solitaire game with all these different types of games it has to choose from. They were weird to me at the beginning but after a hour of playing they became familiar. I’ve only won 1 game so I don’t play it that often. 2. iFart- It may cost something but it is just so fun to do! Some may call me immature but considering it’s the number 1 app on iTunes at the moment I think it’s pretty decent. 1. Tangram Pro- I have spent hours playing this game for the few days I’ve had it. It was a bit confusing at the beginning but after playing through all the levels I have learned the different positions and can finish them relatively fast.